I love Vietnamese cuisine. It is light, often healthy, offers a big variety of taste and ingredients, inexpensive and above all extremely tasty. During my trip in Vietnam, I was able to discover the great diversity of the local gastronomy and I wanted to share my culinary experience with you. This article is a list of the ten traditional Vietnamese dishes that you should absolutely taste. Bun Cha is a dish from the north of Vietnam and specifically from Hanoi. I had the chance to taste this very popular dish at the source, in the narrow streets of Hanoi. It is made from meatballs and thin slices of meat cooked on charcoal barbecue. They are served with rice vermicelli, a rich variety of aromatic herbs (mint, coriander, green salad … etc) and a bowl of sweet and sour sauce / broth with thin slices of marinated carrots and papaya. Before you start tasting, you should soak the rice vermicelli, the meatballs, the thin meat slices and the herbs in the bowl of sweet and sour sauce. Spicy taste lovers can add small slices of chili in their bowls. Once the vermicelli and the meat are well soaked, you can begin your tasting. I have never tasted the meatballs served with Bun Cha in Vietnam. However, I found the mixture of the broth with pickles, fresh herbs and rice vermicelli absolutely delicious. I loved this combination and the fact that every Bun Cha was served to me with nem ran on a side made it even more enjoyable. If you are looking for the best place to eat a Bun Cha in Hanoi, I suggest the famous little shop (Bun Cha Huong Lien) in Hanoi’s Old Town. This little restaurant is where the former President Obama and Anthony Bourdain had one of their “famous” meals during their stay in Hanoi. Since their lunch there, this little restaurant set up the Obama menu, with a combination of nem ran, a Bun Cha and a Hanoi beer, for less than 6$. Admit that this one was the first dish you thought about while reading the title of this article. Yes, the good old Nem Ran (also called Chả Giò in the south of the country) is one of the must-try dishes of the Vietnamese gastronomy. It was much appreciated in the old days at the imperial court and is commonly called imperial pate or imperial roll in some Francophone countries. 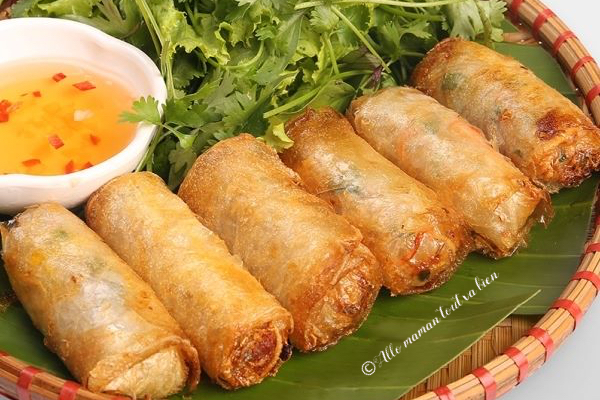 These rolls are made of rice paper stuffed with a spoon of minced meat, vegetables or seafood(usually shrimp) and are deep fried in boiling oil. They are usually served with a large bowl with green salad leaves, coriander, mint and some Nuoc Mam sauce with minced garlic and ginger. The vegetarian version of the Nem Ran is one of my favorite Vietnamese dishes. I feel hungry just thinking about it! The most delicious Nem Ran I ate in Vietnam was served to me in a small Bistro in Hue, in the center of the country. The Bánh Mi is the Vietnamese version of the classic sandwich that we all know. It is a dish inherited from the French colonialism and was introduced to the Vietnamese cuisine in the 19th century. However, the Vietnamese baguette is smaller than the French one. It is made from a mix of wheat and rice flour which gives it a thiner and crisper crust. What makes the Bánh Mi special is the raw vegetables: fresh cucumber, coriander, carrots and white radish marinated in vinegar. It is a sandwich rich in flavors and textures combining the freshness of raw vegetables, the good taste of the spicy sauce and the crispness of the baguette. This Vietnamese sandwich is available in several versions, but the most classic one is made with slices of meat, pâté and local cream cheese. I tried the vegetarian Bánh Mi (also called Bán Mi Chay) several times, in different regions of the country. I think it is a convenient and very inexpensive meal that deserves to be tasted at least once during your stay in Vietnam. The best Bánh Mi I have tasted during my stay in Vietnam was in Hanoi, in a small restaurant that serves only vietnamese sandwiches. I was able to choose my sauce, my basic fillings as well as the vegetables that go with it. Here is another Vietnamese dish that is super famous all around the world right? The Phó soup is one of the most popular dishes in Vietnam. 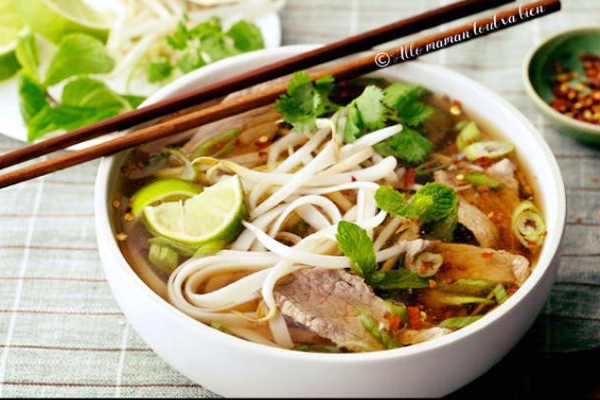 It is native to Hanoi and is made from a meat broth, thin slices of beef and rice noodles. It is a dish that is found everywhere in the streets and Vietnamese love it. They eat it at any time of the day. I am a big fan of soup and I could eat it every day. The Pho soup was one of my little guilty not so guilty pleasures in Hanoi. I particularly liked the fact of plunging large quantities of fresh herbs into my soup giving it much more flavor. I was very surprise on how easy it was to find vegetarian Pho soup in Hanoi, knowing that in Vietnam, people love their meat! The best Phó I’ve eaten in Vietnam was in a small restaurant called Quan Pho Thin. There is only one option on the menu, Phó, their specialty. The Bánh Xéo is a specialty of the Mekong delta region. 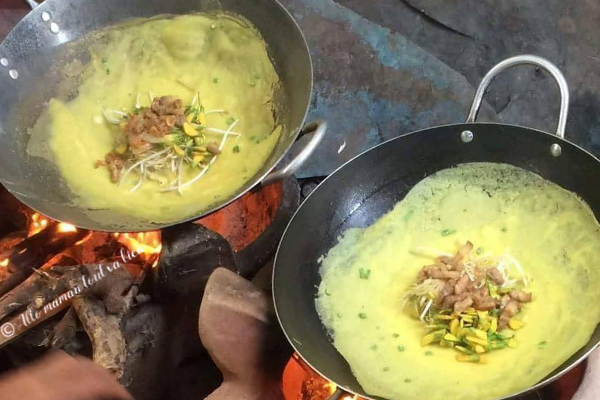 It is a pancake made with flour and turmeric, garnished with soya sprouts, meat or shrimp. This typical southern dish is also consumed in the north of the country. However, the basic crepe is much smaller and the toppings may vary from one region to another. I enjoyed tasting Bánh Xèo. The pancakes came with a nuoc mam sauce as a side and several aromatic herbs (as asual). It is a fairly light dish that is easy to eat and digest. I would recommend to give it a try during your stay in Vietnam. Gôi Cuôn is more commonly known as spring rolls. And to do justice to its western name, this traditional Vietnamese dish gives a small sensation of fresh spring when you bite it. This southern specialty is one of the most popular and famous Vietnamese food around the world. 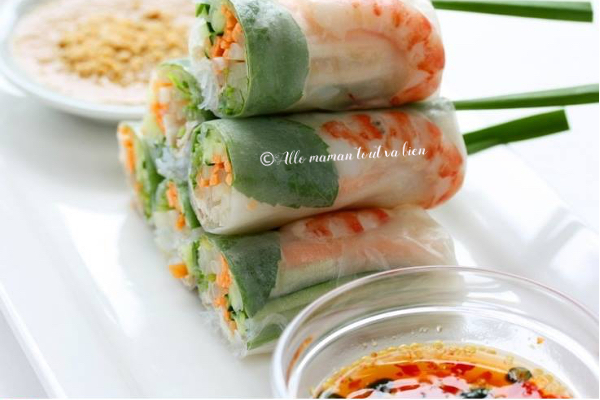 It is made from rice paper topped with raw vegetables, aromatic herbs, rice vermicelli and in some cases shrimp or meat. One of the best spring rolls I ate in Vietnam was in a small restaurant named Nha Trang Xua in Nha Trang City, south of Vietnam. I especially enjoyed the freshness of their food and their very delicious sauce served with the Gôi Cuôn. 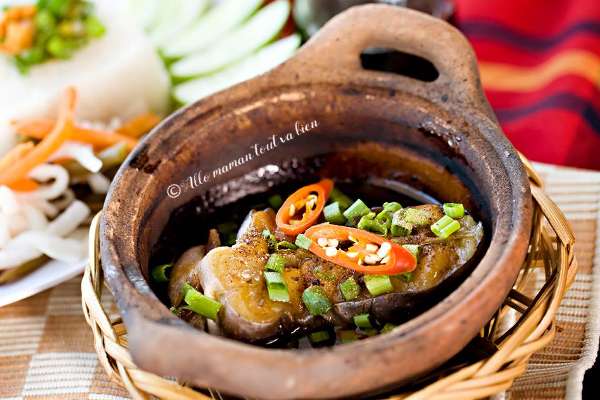 Cao Lau is a specialty of Hoi an, a coastal city in central Vietnam. This traditional dish is made of yellow noodles. 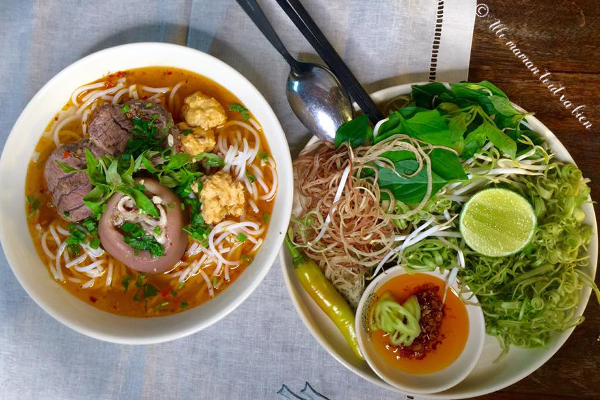 In general, Vietnamese dishes that contains noodles are served in a soup or a broth, which is not the case of the Cao Lau. Noodles are stir fried on a local sauce with thin slices of pork or beef and several aromatic herbs (as always). In most of the restaurants in Vietnam, the ingredients of Cao Lau are served to the customer displayed in small plates. It is the customer who mixes them and put the quantities of meat or herbs that they wish. This delicacy from central Vietnam has not been one of my favorite dishes because I do not eat meat and I have not really enjoyed eating plain noodles. However, my friends and my brother loved this typical dish from the old town of Hoi an. 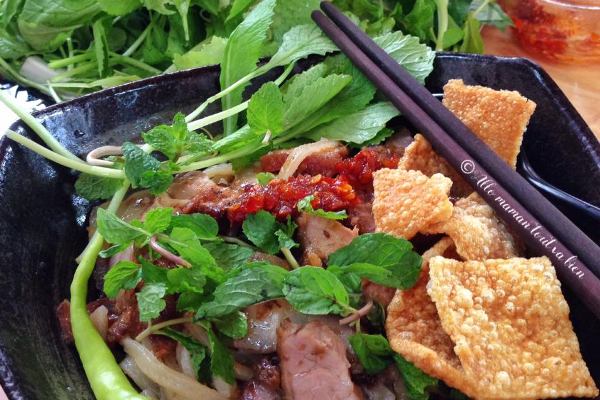 As its name suggests it, the Bun Bò Hue originates from the city of Hue, in central Vietnam. It is a dish made with an orange broth containing shrimp paste (special to the region) and thick rice vermicelli (different from the one used for other Vietnamese soups). This dish has a spicy taste and contains several varieties of meat. To recognize a Bun Bò hué of high quality, you must observe the peaces of meat. If the meat color is clear, it means that it is a good quality Bun Bá hué. The Cá Khô To was introduced to me by a good friend of mine in Hue. She explained to me during our meal that the flavors reminded her of some childhood memories when her (Vietnamese) mother cooked Cá Khô To for the whole family. This dish is usually made from caramelized catfish simmered over low heat in a clay pot. It is a simple dish to make but will leave your palet asking for more. The Cá Khô To is native to the southern region of Vietnam where fish hold a place of honor in their diet. This is a dish I highly recommend trying. You won’t regret it! After all these super tasty and savory dishes it is time to go to discover the traditional dessert! The Chè (sounds Tier in Vietnamese) is one of the most unusual desserts I tried so far. It perfectly combines a bunch of unusual ingrédients, different textures and unique flavors. I’m not a big fan of desserts, however, tasting Chè was a nice experience. I particularly liked the unusual mix of ingredients such as red beans, aloe vera, lotus seeds, taro, seaweed jelly, coconut pudding … etc. 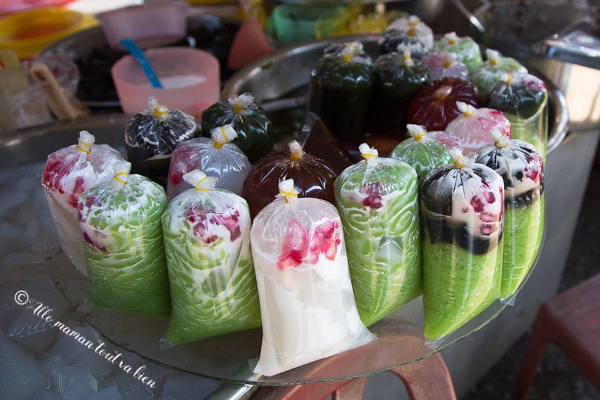 It is a dessert that I strongly recommend tasting during your stay in Vietnam. The best chè I had in Vietnam was in the streets of the old quarter of Hanoi, in a small food stroll “Little Bowl”. The owner was attentive to my preferences and taste and advised me very well about the combinations to try. 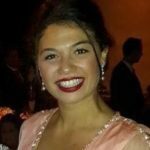 I hope you liked discovering more about Vietnamese Cuisine. Please feel free to share your own experience with me in a comment and give any suggestions that could complete this list. 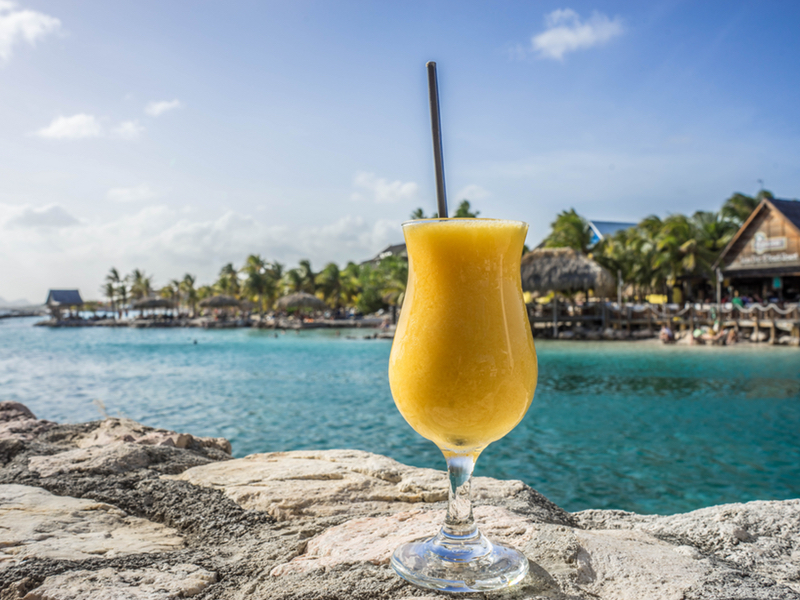 If you liked this article, share it on you favorite social Media. It would help me a lot and I would be very grateful for it!